Buyer has to agree following terms & condition before purchasing any merchandise from gujaratibooks.com. Following terms & condition will be applicable once order has been placed. We don't give guarantee of exact date for delivery for Air Mail, Sea Mail & Registered Post orders. We can just tell you the approximate time taken by each method of shipment. GujaratiBooks.com will deliver the merchandise on given specific shipping address only & not in the hand of specific person. If recipient is not at the given address, the books would be left with the neighbor along with an attached note. For the items delivered by the courier / speed post / registered post, their respective policies apply. gujaratibooks.com reserves the right to charge the order if by any chance the recipient rejects the order for any reason. gujaratibooks.com is not responsible for missed/late deliveries due to curfews, acts of government, acts of nature, holidays, incorrect addresses or acts of war. gujaratibooks.com reserves the right to deny its services to any sender, without any explanation. gujaratibooks.com is not liable for more than the retail cost of item. gujaratibooks.com shall try its best for prompt delivery; delayed/early delivery for whatever reason shall not entitle the user for any damages or compensation. Inspite of full caution taken at the time of delivery, gujaratibooks.com will not be responsible for a mis-delivery if the receiver of the books at the address on the order form misappropriates, damages or fails to hand over the books to the person named on the order form and takes the item posing himself to be the correct person. The product/services provided on this site are without warranties of any kind. gujaratibooks.com does not warrant that the products/services offered will be exactly similar, error free, or that the defects will be corrected. Usually it takes 2 to 4 working days time to process the order. Once the order dispatch by the courier these may vary according to the remoteness of the area and efficiency of the couriers. Acknowledgment signature and courier receipt will be available upon request on extra charge (Only if courier option selected as shipping method). For all other shipping method acknowledgment signature is not possible to provide. Shipping charges includes packing, transaction, handling & other service charges. Orders once placed cannot be canceled, and any changes in the same must be notified by the sender within TWO working hours after submitting the order. gujaratibooks.com will make its best efforts to incorporate changes but will not be held responsible if an advised change is not made. Order cancellation charges would be 10% of total order amount if order amount is below Rs 5000.00 & 1000.00 Rs if order amount exceeds Rs 5000.00. In any situation if it requires to return merchandise back then all shipping charges & other charges will be borne by buyer & refund will be only granted once it's reach to original source in a good condition. gujaratibooks.com will deliver exactly the same items displayed on its web pages and from the same sources indicated. However, in certain unavoidable circumstances arising due to non availability of products from indicated sources, it reserves the right to change the source and deliver approximately similar kind of product. If similar kind of product is not available, gujaratibooks.com will inform the sender to change the order or wait until it becomes available. gujaratibooks.com will not charge more than the prices mentioned on its web pages but in certain unavoidable circumstances it reserves the right to change the prices anytime, without any prior notice and charge the sender accordingly. Any sudden increase or change in the shipping rates,taxes & other duties by Indian government will be bound to pay by any overseas & Indian customers & will have to pay for extra according new shipping rates,taxes & other duties levied by Indian government at any time till last dispatch of merchandise. GujaratiBooks.com has got rights to demand in this situation or we can adjust the order by reducing time frequency in case of magazines subscription or can reduce merchandise quantity in case of books, CDs & all other items to adjust the new shipping rates, taxes & other duties . gujaratibooks.com reserves the right to dispatch that items separately, not as a single package, if certain items in the package are not acceptable by certain couriers. gujaratibooks.com does not, in any way, claim ownership or right over the Trademarks, Brands and Company Names used at this site, which are owned by their respective owners/companies. References to these products and company trademarks are used solely for the purpose of identifying the products supplied at this site. While gujaratibooks.com ensures to deliver best quality products from well known sources, it is not responsible if the quality of the product does not match the expectation of the recipient. While most of the books are dispatched by Indian postal service, liquid tinned items and certain other products may be dispatched by local courier, speed post or by registered post parcel depending upon the remoteness of the recipient. 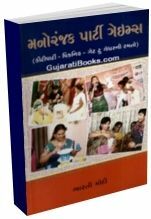 gujaratibooks.com has the sole authority to select the best means of dispatching from the above options. In the unlikely event of a dispute relating to the services of gujaratibooks.com, , the dispute shall be subjected to the jurisdiction of Mumbai (India) courts. The sender is bound to above terms and conditions once he/she places the order. The sender should read the above terms and place the order with gujaratibooks.com only if they are acceptable by him/her. If there is any sort of dissatisfaction with the service or with any terms, conditions, rules, policies, guidelines or practices of gujaratibooks.com, your sole and exclusive remedy is to discontinue using this service. superb and very helpfull in parties.